Other webinar providers can implement the new Webinar Extension API to become a supported webinar provider for Dynamics 365 for Customer Engagement, just like On24. Once a webinar provider implements the API on their webinar service, the webinar provider can be configured in Dynamics 365 for Customer Engagement to use their webinar service for event management. 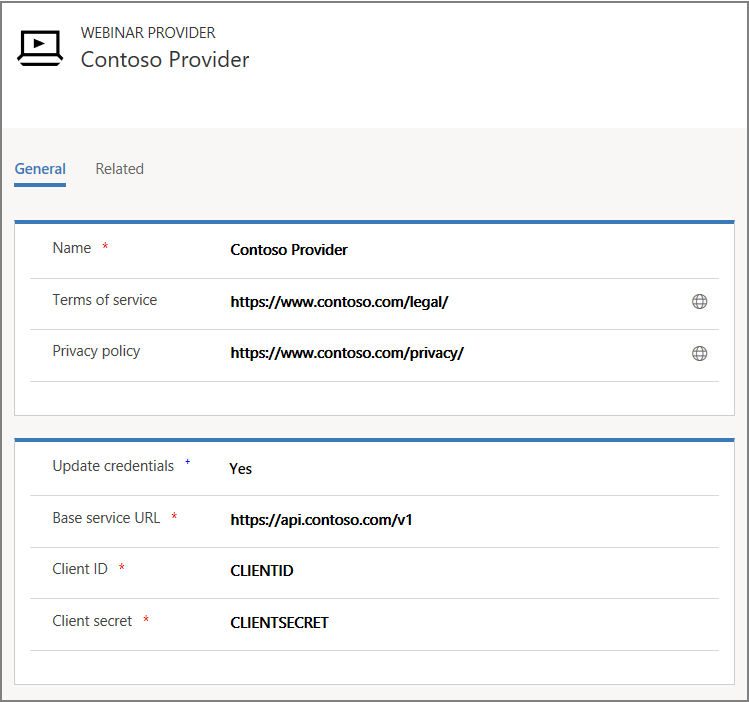 When adding a new webinar provider in Dynamics 365 for Customer Engagement, you will need to have Client ID and Client secret values. This information is provided when you sign up for a webinar provider. The authorization of the webinar service to Dynamics 365 for Customer Engagement uses OAuth 2.0 standard protocol. More information: OAuth, Client ID and Client secret. Open Settings > Advanced Settings > Event Management > Webinar Providers and select New. Fill in the required fields as shown below. The field Base service URL is the URL of the webinar service that implements the API. Open Settings > Advanced Settings > Event Management > Webinar Configuration. Here you'll see a list of existing configurations (if any). To create a new configuration, select New. Enter a Name that you and others will recognize. Accept the consent and Save. Click on the Authenticate button on the ribbon. This button will trigger the authentication flow to the authentication endpoint of the webinar provider with the specified Client ID and Client secret. Login using the User created in the pre-requisites, this will trigger the OAuth flow with the provider.